Giro organizers have relocated the start of today's stage to Tirano, shortening the stage by 55 km, from 205 kms to 150 kms. Organizers cited heavy rains in the mountains near Livigno, and even some snow on the first climb. CSC's Ivan Basso will continue in the race, even though he now trails by 39:22. Australia's Brett Lancaster of Panaria was the fastest kilo man in the field Saturday evening, taking the prologue of the 88th Giro d'Italia. The unusually short prologue favored riders with track experience and sprinters, and Lancaster, who took a gold medal in Athens in the team pursuit, made the most of it, covering 1.15 kilometers in 1:20.958. Of course, the shortness also means you can throw a blanket over about the top half of the field, with the top 10 all within 2 seconds of Lancaster. The last-placed rider was Australia's Trent Wilson, 17 seconds back of Lancaster. The prologue was run under the lights, along the coast at Reggio Calabria, with prime-time TV coverage in Italy. Discovery's Paolo Savoldelli finished highest among those with GC aspirations, in 1:21.923, fourth on the stage. Alessandro Petacchi was 3rd on the day, just behind teammate Matteo Tosatto. T-Mobile's Olaf Pollack rounded out the top 5. Stuart O'Grady's special rig didn't get him the maglia rosa, as he had hoped, but did place him 6th on the stage and overall. Michael Barry led North Americans in 15th; Discovery teammate Ryder Hesjedal, also of Canada, was 18th; Dave Zabriskie was 20th; Tom Danielson 75th; Tony Cruz 98th; Jason McCartney 113th; and Christian Vande Velde was 152nd. 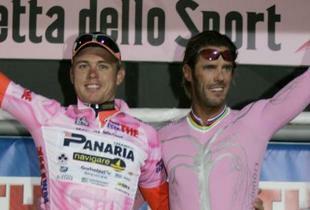 Defending Giro champ Damiano Cunego was 22nd, while his teammate Gilberto Simoni, the 2003 winner, was 97th on the stage. Mario Cipollini took a parade lap, starting last in a glow-in-the-dark pink skinsuit that featured the names of all the towns where he won his 42 career Giro stages. In a few hours the 88th Giro d'Italia gets under way in Reggio Calabria with an unusually short prologue: 1.15 kilometers, or about .7 miles. Ex-trackie Stuart O'Grady has had a bike built specifically for the prologue; RoadCycling.com offers a look at the track-style setup, with a fixed 53x14 gear, narrow crank, "hidden" brakes, and bolted wheels. The Giro has a different color assignment of jerseys than the Tour de France (or the Vuelta), and Eurosport goes over the differences, including an explanation of the "race-within-a-race" Intergiro (sky-blue) jersey. They've also got the official start list of 197 riders (Liberty starts 1 rider short because Ribeiro was ineligible for high hematocrit; the squad has since fired the Portuguese rider). Today and tomorrow, there's same-day TV coverage on Outdoor Life Network in the US, running from 5-7 pm Eastern. Online, look for live text updates from the usual suspects at CyclingNews and VeloNews. The official Giro site is hosted at its primary sponsor: Italy's sports newspaper, La Gazzetta dello Sport, but the Giro special is available in English, French, German, Spanish, and of course, Italian, which you can expect to be updated most quickly. Portugal's Nuno Ribeiro won't take the start of the Giro d'Italia Saturday, after turning up with a hematocrit of 52 percent, where anything above 50 is grounds for exclusion. Although the test results don't count as a doping positive, but only as a "health control", Liberty Seguros management said Ribeiro was being sent to Lausanne for more complete testing by the UCI. The team says Ribeiro had previously tested between 47 and 48.5 after training at altitude, but tested at 52 almost immediately afterwards. Liberty is going above and beyond by providing Ribeiro for a battery of UCI doping tests to either confirm or deny the possibility that Ribeiro was artificially boosting his hematocrit. Many teams would have their rider serve out their 15 ineligible days, then stick them right back out on the start line.